The Young J. Edgar Hoover: A Book Review Essay - Updated April 15, 2008! This book is now available in paperback. Information is as follows: US $17.50, CAN $18.95, UK £10.99, ISBN: 9780306816277, USBN-10: 030681627X, Da Capo Press, Cambridge, Mass, 472 pages. How can the US deal with an amorphous terrorist threat from a network of militant Islamists while preserving the civil liberties enshrined in the constitution? This is the question Kenneth Ackerman, author of Young J. Edgar Hoover, the Red Scare and the Assault on Civil Liberties, returns to time and again throughout his book on J. Edgar Hoover’s early years as Ackerman, a DC lawyer with lengthy political experience, examines the record of a troubled period in US history that is all too reminiscent of today. By 1919, the US had ended its involvement in World War I but the country was in turmoil. Labor strikes, masses of unemployed returning soldiers, hyperinflation and a swell of non-English speaking immigrants primarily from Russia, Eastern Europe and Italy contributed to the unstable brew. Meanwhile, the country was left without effective leadership: President Woodrow Wilson was first engrossed overseas in promoting the idea of a League of Nations as a part of the postwar European peace settlement, and then became incapacitated by a stroke. Abroad, the rise of Bolshevism in Europe and Lenin’s overthrow of the Russian Government in 1917 sent shivers through America’s business and political leadership. In a sense, the 24 year old J. Edgar Hoover turned out, for himself at least, to be in the right place at the right time. Ackerman places Hoover’s meteoric rise from clerk to Director of the newly formed Federal Bureau of Investigation in the context of the times and the personalities of the Justice Department. Hoover made his job his life. His considerable organizational skills - including detailed and massive record keeping on his fellow citizens - enabled the Bureau to establish and maintain copious illegal files on far too many innocent American citizens, to engage in illegal massive searches and seizures targeted against the immigrant community in a single-minded quest of rooting out possible Communists. From a Constitutional standpoint, too, Hoover’s actions made a mockery of the First Amendment’s rights to Freedom of Speech. In the end, this mini-Cultural Revolution in reverse resulted in far too many arrests but few convictions and the American public soon tired of it. Among those on Hoover’s suspect list included two of our most revered Supreme Court justices - Felix Frankfurter and Oliver Wendell Holmes. Hoover comes across in this book as an almost two dimensional, mercurial person with a lust for power and prestige, an inveterate snoop, sometime blackmailer and meticulous records keeper who was not above fabricating tales or at the very least stretching the truth as he built his own power base on that of his new bureau. Years later, information supplied by Hoover helped “red-baiter” Senator Joe McCarthy fan the flames of another “red threat” before the House Un-American Activities Committee much as the Bush administration and portions of the Republican Party now attempt to use “Islamic terrorism,” the new “red threat,” to build political support. In fairness, Hoover did not create the threat of a Communist takeover of the U.S., but he was intimately involved in grossly exaggerating it. In so doing, he went well beyond what his boss had ordered or that he could prove. This began with a round up of thousands of the suspicious (to him) people, their lengthy incarcerations in terrible conditions awaiting trial, and the ultimate deportation of 82 non-US citizens. In the end, the 1919 red raids primarily netted thousands of innocents. Arrest warrants were manufactured on the spot – many were so generic or based on unsubstantiated rumors that they were summarily tossed out of court when Hoover’s victims finally made it to trial. Brilliant and personally risky legal work on the part of lawyers like Frankfurter who were willing to take on these cases helped blunt Hoover’s Damocles sword. Kudos to Ken Ackerman for bringing this forgotten story to light and to Carroll & Graf Publishers for publishing it at a time when America’s civil liberties are once again under attack from an over-zealous White House in the name of protecting the country. 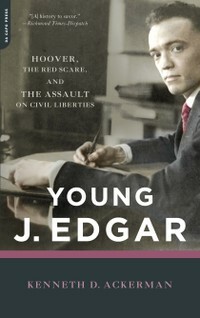 The Young Hoover is a well written, insightful and thought-provoking book that through the use of historical example underscores the dangers to our personal and Constitutionally-protected liberties by an over-charged executive and through unelected officials in the name of a “threat” grossly exaggerated for political purposes. The details: Kenneth D. Ackerman, Young J. Edgar Hoover: Hoover, the Red Scare, and the Assault on Civil Liberties. New York: Carroll & Graf Publishers, 2007, 409pp. Cover photo: Hoover Center frontispiece via Amazon reviews.